Hi there, I hope you are doing well and that you had a wonderful Christmas. I spent Christmas in France with my family and being in France, the holiday was mostly spent…eating! The French sure know how to cook and they do enjoy spending days on end at the lunch table on festive occasions. And since everything is soo good, well it’s difficult to be reasonable so inevitably we end up overeating! Now I’m in Iceland with my family for a few days to celebrate the New Year. My kids were hoping for snow but at the moment there is none but according to the weather forecast we should have some snow later this week. I’ll be sure to post some pictures of the New Year célébrations and the fireworks which are quite impressive here. 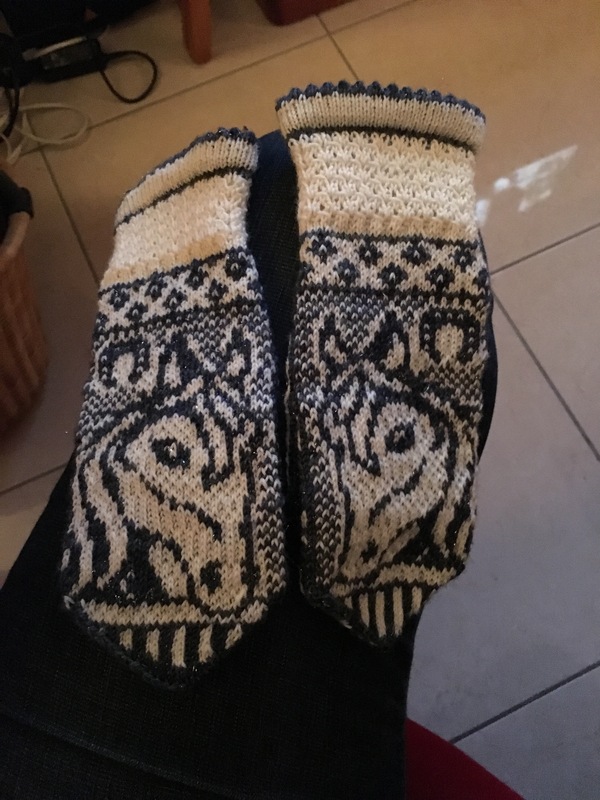 I finished one project before Christmas that was a while in the making, my Irma mittens. Intricate color work mittens, the most complicated I have ever made! I think they look wonderful and I hope my sister will love them too. I’ m going to take a little break though from color work after this as I was a bit frustrated, sad to say, at the end because it took so long to make these. Color work like this takes concentration and I was never able to work for long periods at a time on these. But I did purchase a number of patterns from the same designer and they are all color works and I definitely will need to knit them too. But here they are, my famous Irma mittens. As for my travel knitting, I took yarn for two projects only. First I bought my very first kit ever from A Little Skein Big Wool but that is an online shop that sells only or at least mostly knitting kits based on children’s stories. 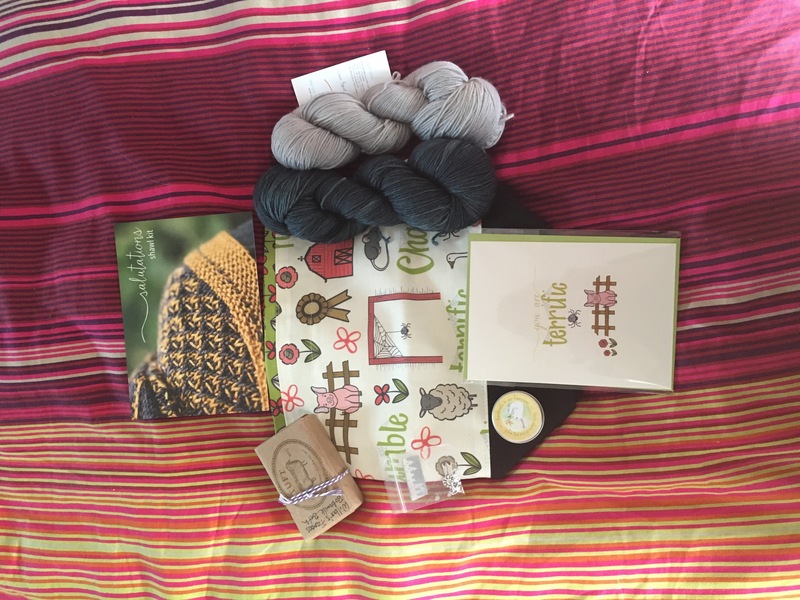 The kit I chose was the Charlotte’s Web kit called the Salutations Kit. Being the undisciplined knitter I am, I of course chose the Luxe version which included a project bag, a set of stitch markers, a project keeper, two skeins of yarn from Sunshine Yarns, the shawl pattern For the Love of Spiders by Martina Behm, a greeting card, a little chocolate and handmade soap. I got the package on December 24th which was just perfect and I really love the kit. And so all the projects I had planned on taking with me were left aside and in stead I took this new kit with me and I cast on the drive to the airport. Does that not look IRRESISTEBLE? I’m sorry about the picture being sideways but I’m posting using my tablet and I wasn’t able to correct the positioning of the picture. This is a two colored shawl and it has 6 repeats of the pattern you see here and then it becomes more complex. I really love the pattern and the yarn is super soft. I also took a skein of yarn to be able to cast on for the first pair of socks of 2016 as part of the Knit From Stash 2016 which is a KAL being held for the second time via the Facebook group Addicted to Sock Knitting and with designer Heatherly Walker. I participated this year although I’m sad to say that I did not knit all the patterns but this time I’m determined to knit a pair of month and to set up a project page for each one as my challenge for 2016 is going to be using Ravelry more and to set up project pages for all my knits to share and better keep track of them myself. As I sit here and write what will probably be my last blog post of the year I feel so thankful for this year that is coming to an end. I’m so thankful for the readers of my blog. I love sharing my passion with you and I’m so proud and thankful that there are people are out there that take the time to come to my blog and enjoy sharing my passion and theirs for knitting and all things wooly. I’m hoping my blog will continue to grow strong and that my readers will continue to follow my knitting life and participate in the blog. I have at least 2 exciting giveaways planned for the beginning of 2016 – one will include a knitting pattern and the second some handmade knitting accessories and I hope you will participate in those. That’s all for today. Thank you again for stopping by and I look forward to our new year together and thank you for the time we have spent together in 2015. Hi there, I hope you are doing good and enjoying the last few days before Christmas. I have a few more days of work and then I’ll have a little holiday and I’m really looking forward to that. I can’t wait to relax and spend time with my family and enjoy some quality knitting time without having to think of work! I’m currently working on a gazillion projects so I’m not making much progress on each as I’m just knitting a bit on each before going on to the next. I did however want to show you the progress I’m making on the horse mittens that I’m making and that I HAVE TO FINISH BEFORE CHRISTMAS! I’m at last working on this again. Once I had the first mitt done, I put this aside, too much colorwork I think. But now I really have to do as much as I can each day or this will never be finished in time for Christmas and this is a Christmas gift after all so!!! I really love how these look and I hope they will fit the recipient in the end. So I’m about halfway through the second mitten but then I need to do both thumbs and finish. This much colorwork is quite time consuming but the result is nice. Now on to new acquisitions. So last week I got an amazing package from US dyer Miss Babs. This is the first time I buy from Miss Babs but I have heard of her yarns for a long time and never had the chance to actually buy one of her yarns. And I think I may have gone a little overboard here because I bought 1 skein + a shawl kit. It is called Sipriz – and I love it. It’s white, blue and brown. And the pattern I chose is the original Yowza Weigh it Shawl by Susan B Anderson. The pattern is super simple, one row repeat, no counting of stitches, just knit on and weigh your yarn in 2 places. So as I was away from home this weekend, I decided this would be the perfect “car knitting” project and so I cast on. I didn’t end up doing much knitting as we were driving in the afternoon/night so the sun soon went down and it was too dark for me to knit but this is where I’m at now and you can see how the yarn knits up. And I also got a shawl kit from Miss Babs and that was a real splurge! As you can see from the picture the pattern is called Simee Dimeh shawl by Romi Hill. The kit comes with the pattern and 7 mini skeins and the color combo I chose is the “Polydactyl”. That is the color combination shown on the pattern pictures here. I find this pattern super interesting, especially the patterning on the lower edge. I haven’t read the pattern yet but when I look at the pictures I feel it looks almost like cross stitch. This might be a little too intricate for travel knitting although I’m not sure. I’m going to think about that a bit more before I decide whether or not I take that with me on holiday. The pattern is called Crucero Shawl by Laura Nelkin. 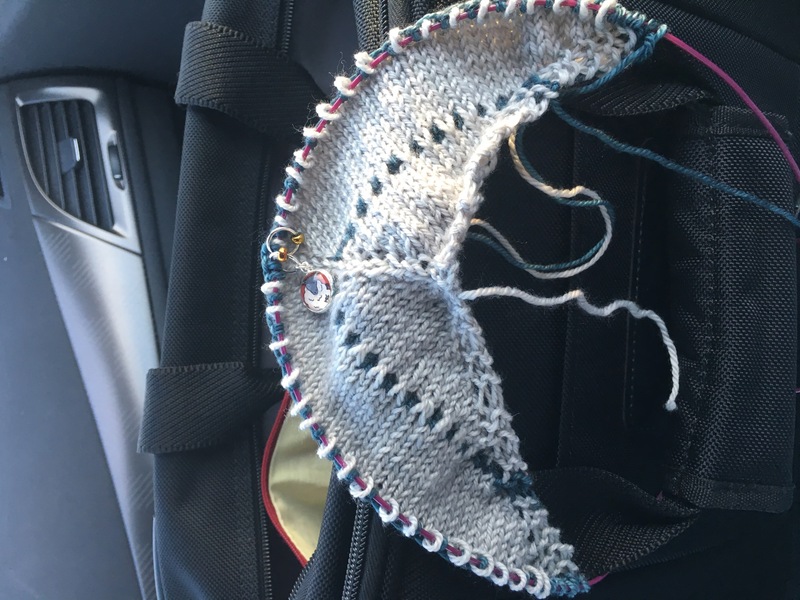 First the 2016 Knitting in France Birthday Game – I have everyone’s but one questionnaires back so I’m just waiting on this one to come through and I’ll be able to send an email to all the participants with the info needed to enjoy the game. Hopefully I’ll have that before the end of the week. Also for 2016, I have some fun stuff for you. There will be 2 giveaways next January that you do not want to miss so I hope you will continue to follow my blog in the new year. I’m super happy to announce that I’m featured as an indie dyer in the latest issue of ASK – Addicted to Sock Knitting magazine! If you are not familiar with the ASK magazine, it is a digital publication run by Debra Garner who is also the lady behind the ASK group on Facebook. The ASK group on Facebook has over 12,000 members, all passionate about knitting socks and using hand dyed yarns. If you are a sock knitter or want to become one, I highly recommend you apply for membership but be warned it is a highly addictive group to be a member of and their “enabling” force is ….well let’s just say it is “convincing”. Also every Wednesday indie dyers get to advertise their yarns and most of them offer some kind of discount so that is nice too. So in addition to running this amazing group on Facebook, Debra also issues a digital magazine 4 times a year and each issue is stock full of sock patterns, interviews with designers and dyers, articles written by knitters, spinners etc. This fall issue has 150 pages and I’m featured on pages 49 to 53. So if you are curious about my work as a dyer and want to see some behind the scenes pictures or just want to see what this amazing magazine is all about, then I definitely recommend you purchase this fall issue! Thank you for coming by today and I hope you have a wonderful week. Christmas is not far away if you celebrate Christmas so maybe you are on holiday or almost like myself. I’ll be on holiday in a few days and can’t wait! Hi there, so at last it is time to announce the winner of the Yarn Valet giveaway. I had hoped that more people would get involved but maybe this is just not the best time to be doing a giveaway? Don’t know. Anyway, there were 2 participants and there are 2 prices and I did still use a random number generator to choose the winner of the bigger price which is a Yarn Ball Winder by Yarn Valet. All done and I have taken my new yarn ball/cake off the winder and you can see that my yarn is still in the hole on the winder making it super easy to start knitting from the inside of my ball. Here is another ball all done. Note that this time the shape is not the same, this one is more like a cone whereas the one before had a cake shape. This is determined by how you wind the yarn on. So the winner of the Yarn Valet Ball Winder is….Sarah! So congratulations Sarah! Please send me your full name and postal address by email to: knittinginfrance@gmail.com and I will give your info to Yarn Valet who will in turn send you your price! And the second winner is Faesarah! So congratulations to you Faesarah! I think I may have your contact details but just to be sure, please also send me your full details by email and I will send you your prize! You have won a set of Yarn Valet Stitchers GPS and a set of my own handmade stitch markers. So congratulations to both of you and thank you for participating! Hi there, how are you doing today? I hope you are doing great. Before I dive into today’s subjects I just wanted to remind you of my Yarn Valet review and the giveaway. You can read about it here and to participate just leave a comment below the blog post. I will draw the winner tomorrow Thursday 17th of December. And then there is the 2016 Birthday game. I blogged about this a while ago and some of you decided to join in the fun so I sent out emails with questionnaires to help us get to know each other better and so on. I have only received replies from a few of the participants so I would like to ask that if you are one of those that expressed interest in participating, that you check your email to see if you got my email and questionnaire and that you fill it out and send to me as soon as you can. If for some reason you did not get my email, please let me know by sending me an email to: knittinginfrance@gmail.com so I can send you the missing questionnaire. I’d like to be able to put the finishing touches on the preparations for the game before the Holidays. Now, THE TWELVE DAYS OF CHRISTMAS. You may have seen this hashtag on social media and I believe at least 2 great companies are spoiling us in the last few days up to Christmas and just in case you are not aware of that, I thought I’d share the info with you here. First there is Kettle Yarn Co – Linda of Kettle Yarn Co in the UK is offering one promotional item each day leading up to Christmas. She announces her offer of the day on Instagram so you should follow her there to get some of her gorgeous hand dyed yarns, project bags or patterns at a bargain price. That’s all for today. Take care and I’ll be back tomorrow to announce the winner of the Yarn Valet give-a-way (so don’t forget to participate). Hi there, today I’m going to share with you this great ressource I recently discovered. We all have to or want to substitute yarn in a pattern at some time. It’s hard to actually not come across that “problem” when one is a knitter or a crocheter. Could be because we don’t have the particular yarn our pattern calls for in our stash and we don’t want to or are not able to buy it. So then we have to find the right substitute and that can sometimes be tricky. I usually try to find something that is not only of the same weight but if possible with the same or similar composition. Then one always (well the serious knitters) has to swatch to be sure the gauge is the same and if not then make the necessary calculations to modify the pattern just to be sure we’ll end up with a garment that can actually be worn by a human being. And now there is a free website that can make yarn substitution way easier than ever before! This may not work for indie hand dyed yarns but it does work for a very large number of well known commercial yarns and I’m pretty sure you will find this useful. You can search for yarns by brand, weight, fibre content or name. They have a huge database of both well known and lesser known brands. So how does this work? Well, you enter the yarn that your pattern calls for and the site then comes up with a list of possible substitute yarns and sometimes even links to buy that yarn from an online shop. I think this is just brilliant and I actually played with this when looking at what yarn to use for my daughters oversized sweater. You should definitely check this out and bookmark it as it can come in handy I’m sure. That’s all for today. Take care and have a wonderful week. Hi there, I hope you are doing great and enjoying your weekend. I had a day off work Friday and although I had dreamt of spending the entire day knitting in front of my laptop I ended up spending more than half the day doing housework! But then, I knew that was kind of inevitable. With a family of 5 and two long haired cats, well, housework is never NOT on the to do list. After doing my chores I made my first ever video review!!! So I’m going to share that with you here. Like I said this is my first so I’m not sure the quality is up to your standards but I did enjoy doing it and hopefully you’ll enjoy watching it. Today I’m showing you and reviewing some knitting and crochet accessories from Yarn Valet and as promised there will be a giveaway! To join in the giveaway I would like you to check out Yarn Valet website here and browse around the products they offer and then come back and leave me a comment below telling me what you think about their items or which one you would like to buy. I will then use a random number generator and draw two winners from those participating. You have until Wednesday Morning 16th of December to participate and winners will be announced sometime Thursday the 17th- probably around mid-day my time (French time). ps- I’d love to hear from you about what you think of my YouTube review.